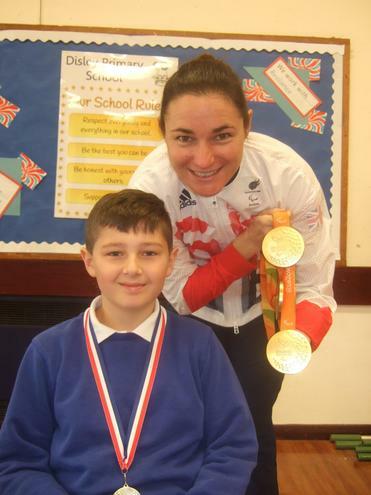 We held our Dame Sarah Storey assembly this week and were pleased to award this term's award to Kyle Whitehead in Year 5. Dame Sarah came along to present the trophy to Kyle, along with a signed photograph and a medal. Kyle has been chosen by the staff for his fantastic attitude to school and consistent effort; he never gives up, no matter how hard the challenge, and is a pleasure to teach. He is always smiling and is keen to help his friends in class too. Dame Sarah praised Kyle for this positive attitude and said that everyone should aim to have the same approach as him. Wll done Kyle, we are all very proud of you!